Dry mill in my bedroom? Yes, after years of setting aside some funds with hopes to pick up a sample roaster, I came across a gorgeous antique 3 barrel probat. Antonio who works at the lab at Exportcafe along with Mario have been restoring this for almost a year. Now this baby is installed in my bedroom along with a sample dry mill! I’m just not sure how long my wife will allow this set up IN our bedroom. I’m sure it will move back out soon. 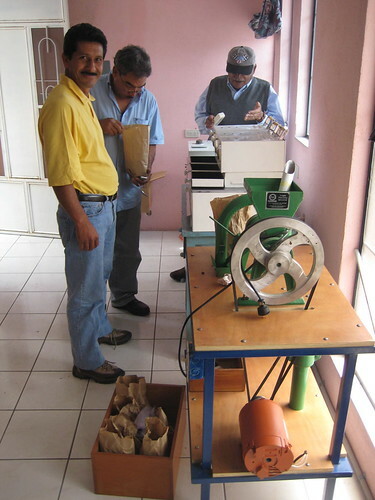 Pictured above is Aurelio Villatoro a long time friend and neighbor who is an award winning producer, Mario our in house probat expert and my grandfather eating fresh roasted FVH as an afternoon snack. Click here for some before pictures. Or click on above picture to see more pictures taken during the first dozen roasts. Yes, we want to build out an elevated cupping above the old building after it is torn down and rebuilt. This will have a great view, fresh air, lots of windows and natural light, a place for you to call home. I am working with Aurelio who is pictured to open a cupping lab and possibly a retail that would be just his, and offer services to a small handful including slow food in huehue. Coffee smoke isn’t bad, that is until your reach the second crack, in which case people don’t want to be in the room near you, let alone sleep in that room. It will be quite rare for us to take a sample roast into second crack. It will be better vented before getting much more use and I’m sure it will eventually find a new home. Roaster in the bedroom sounds cool until you try and sleep, it will be hard to have 100% vented.